Mike Ross Connecticut Post freelance -Staples High School's Amelia Bullock competes in a 200 IM heat during Saturday's State Open Championships at Yale University's Payne Whitney Gym. 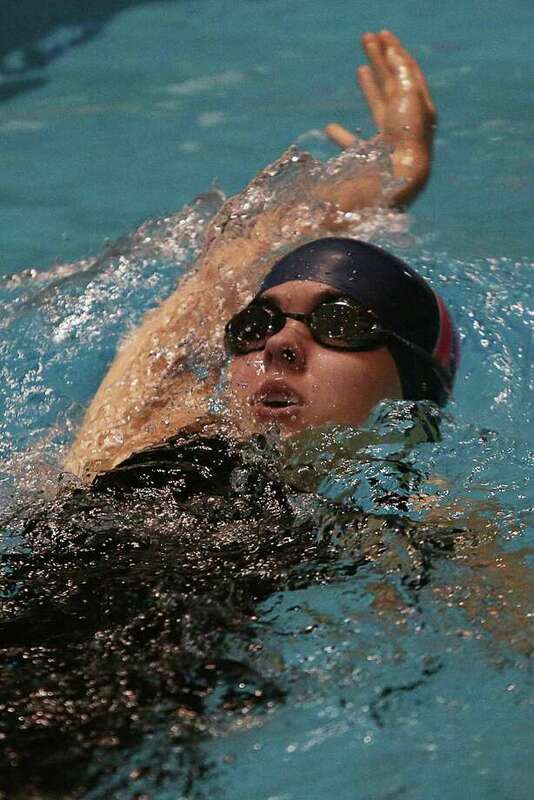 Verity Abel made sure the Staples High girls swimming team finished its season strong. Abel finished first in the 500 freestyle and took second in the 200 freestyle, helping to lead the Wreckers to a 10th-place finish at Saturday's State Open at Yale University in New Haven. Staples narrowly edged Lauralton Hall (151 points) for the top 10 spot, recording 152 points. Five FCIAC teams finished ahead of the Wreckers, as Darien won the meet with 548 points, while New Canaan (439) and Greenwich (436.5) rounded out the top three. Norwalk-Brien McMahon came in eighth with 196 points and Wilton was ninth with 188 points. Abel clocked in at 4:58.47 to easily take the title in the 500 free, finishing well ahead of Brittany Driscoll of Lyman Hall (5:06.49) and Courtney Ferreira of Darien (5:08.44). The race capped a highly successful junior season for Abel, who also won the 500 free at the FCIAC and Class LL championships. "I was really thrilled with how this season went," Abel said on Tuesday. "I was happy with my own personal swims and I was happy with how the team did as a whole." Abel, who also took the 200 free title at both the conference and LL meets, finished the event in 1:52.24 to place second behind Ledyard's Jessica Hespeler (1:50.75) at the Open. "She had a great season," Staples head coach Mike Laux said on Tuesday. Freshman Amelia Bullock had two top-10 finishes for Staples, as well. Bullock placed seventh in the 100 breaststroke in 1:08.23 and took 10th in the 200 individual medley in 2:12.66. The Wreckers also placed 11th in the 200 freestyle relay. Freshman Aileen Coyne, seniors Rebecca Raab and Sarah Cooperman, and Abel clocked in at 1:41.59.